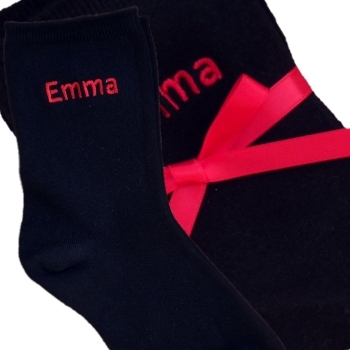 Personalised pair of Ladies black cotton and lycra socks, optional gift presentation to add a personalised ribbon, select Yes. Personalised pair of Ladies black cotton and lycra socks, optional gift presentation to add a personalised ribbon, select Yes. These novelty socks can be embroidered with a short name or up to 3 initials of your choice to provide the perfect memorable gift. Fantastic for birthdays! Personalised pair of Ladies black cotton and lycra socks, optional gift presentation to add a personalised ribbon, select Yes. These novelty socks can be embroidered with a short name or up to 3 initials of your choice to provide the perfect memorable gift. Fantastic for birthdays! The print font style is used for embroidery on socks. You can select a thread colour of your choice for the embroidery. Optional Gift Ribbon: For a small additional fee you may like to add personalised printed ribbon (Ribbon can indicate the occasion or who the gift is to and from!) Additional fees apply.